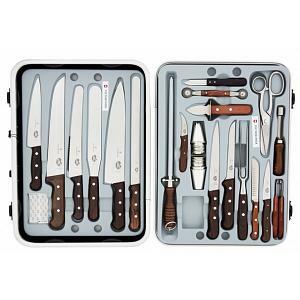 This rosewood knife set from Victorinox Swiss Army includes a spatula, 10" bread knife, 12" chef knife, 8" chef knife, melon baller, lemon zester, lemon peeler, potato peeler, boning knife, sharpening steel, paring knife, chef fork, carving knife, and a storage case. 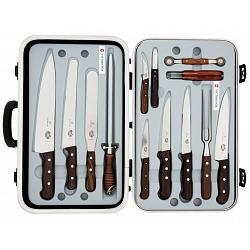 The knives feature comfortable and beautiful rosewood handles and are made from high carbon stainless steel to provide maximum sharpness and edge retention. 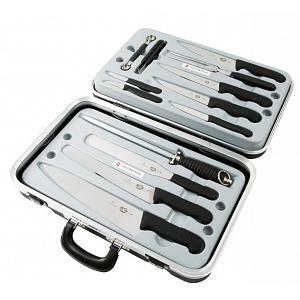 The blades are stamped from cold rolled steel and have bolster-less edges for the use of the entire blade and ease of sharpening. 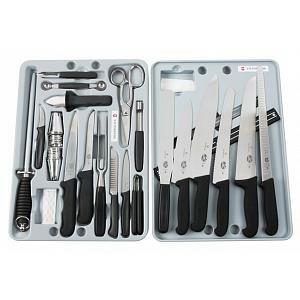 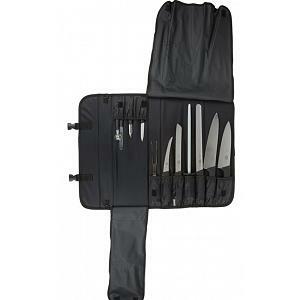 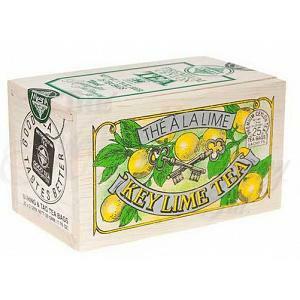 The knife set is made in Switzerland from the makers of the Swiss Army knives and has a lifetime warranty.